We were told there will be monks coming to the front of the hotel at 630 am the next morning to collect the food. Those who are willing to give the food to the monks needed to tell the reception so they can prepare the food before hand. One packet of food is 30 baht. I woke up 615 am to watch the food offering to the monks. 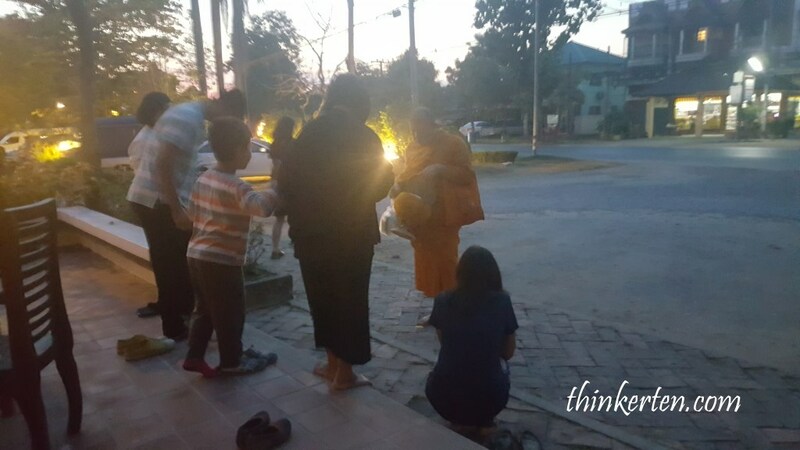 I was expecting many monks to collect the food offering but to my disappointment, there was only one monk came by and some local Thais has offered the food to the monk and in return, the monk prayed his blessing to them. 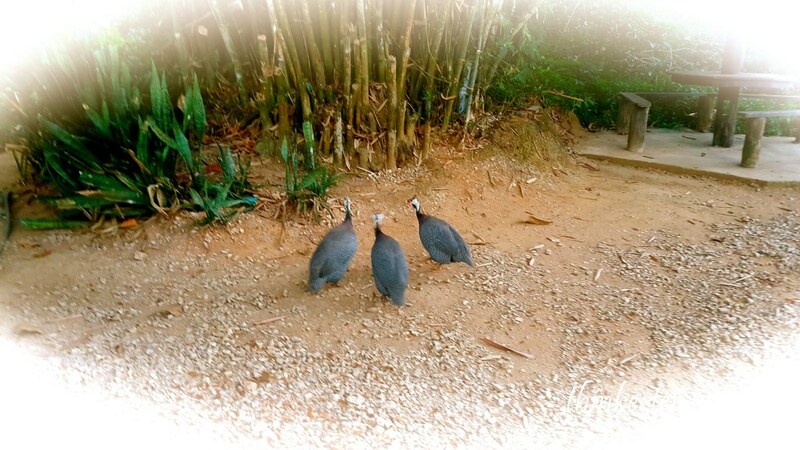 Of course, there were many tourists watching the food offering process. We had our morning breakfast in the hotel and then check out the hotel at around 9am. We were going to stay over in Lampang tonight. Sukhothai to Lampang is about 212km and it takes about 3 hours plus. 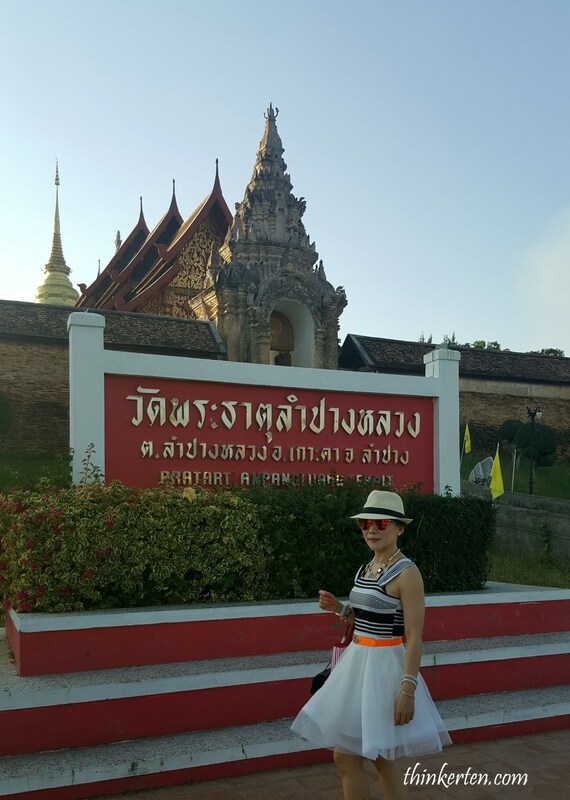 We planned to visit Si Satchanalai Historical Park, another Unesco Site on my way to Lampang. Si Satchanalai Historical Park is located in the middle of the mountain. We were prepared to drive in the mountain road and I was glad the road was pretty smooth and easy to drive. No hassle and there is totally no traffic and the roads are super wide. 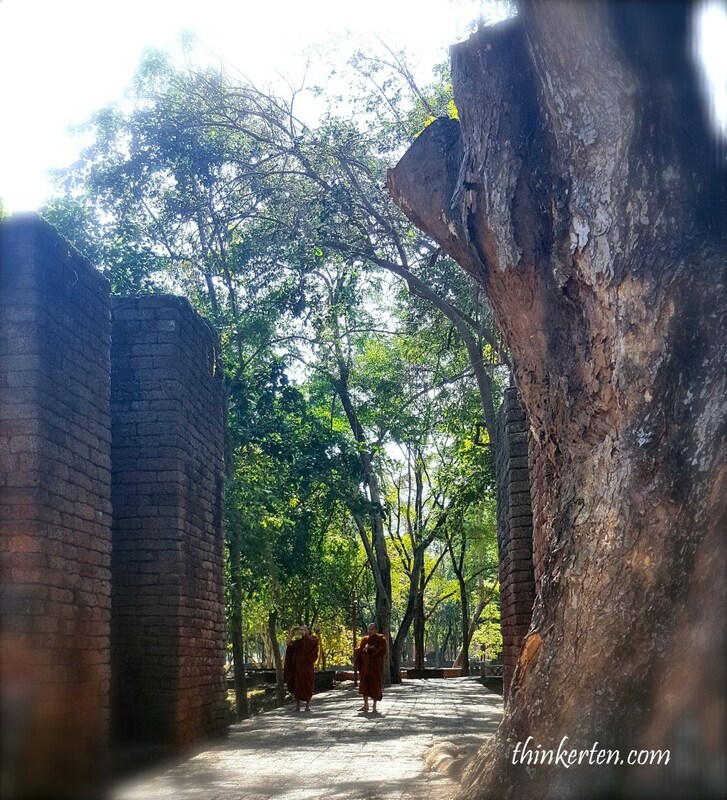 The Historical park covers the ruins of Si Satchanalai and Chaliang. Si Satchanalai, which literally means “City of good people”, was founded in 1250 as the second center/second home of the Sukhothai Kingdom and as a residence of the crown prince in the 13th and 14th centuries. In shorts, it is kind of a holiday home for the Sukhothai Kingdom. 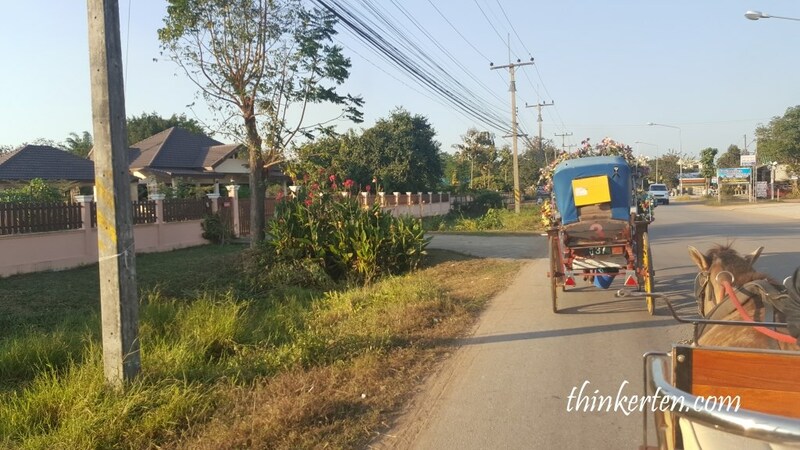 We added a stop at Si Satchanalai on to our road trip as we headed North from Sukhothai to Lampang. 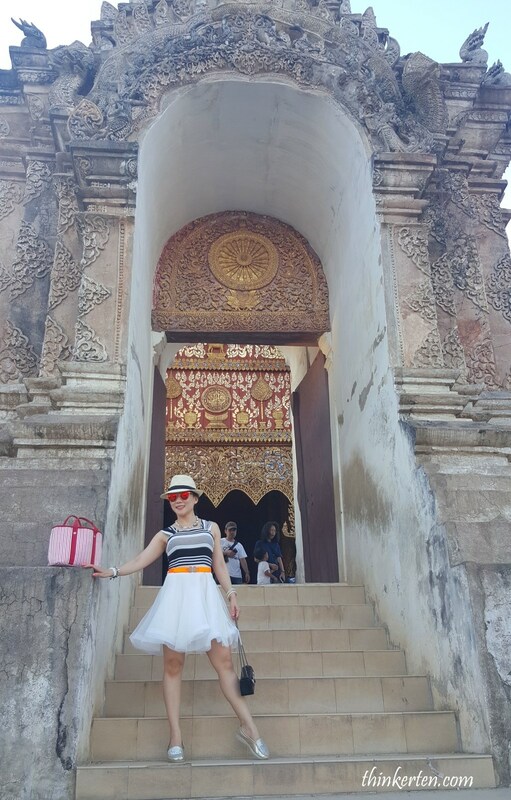 We highly recommend a trip to Si Satchanalai. This park is less crowded than Sukhothai and smaller. And what make it so special is the old Ruins are located in the mountain. Around 3 hours you can really enjoy cycling around the Temples. Alternatively, you can also hop into the tram and it will bring you around the park for about 20 mins. The tram operator only speak in Thai. The part we really enjoyed about Si Satchanalai is that the park is more natural than Sukhothai. There are many more trees and the park is slightly less developed. You can rent bicycles at the park gate and then enjoy a few hours of cycling and temple exploring. The pond behind me was full of small leaves and that is why the whole pond looks green in color. Not as many things to see as the Historical park in Sukhothai but is well worth the trip. Visiting Si Satchanalai is a bit like getting in an Indiana Jones movie. Some Temples are hidden in the forest, there’s a feeling of finding something undiscovered before. We had our simple lunch break outside the park. The food was not that great and I was more concern for the hygiene issue. Since we wanted to save the time, we decided to had our lunch in the stall outside the Park. After our lunch, we were on the road again to Lampang city, another 154km away from the Si Satchanalai Historical Park. 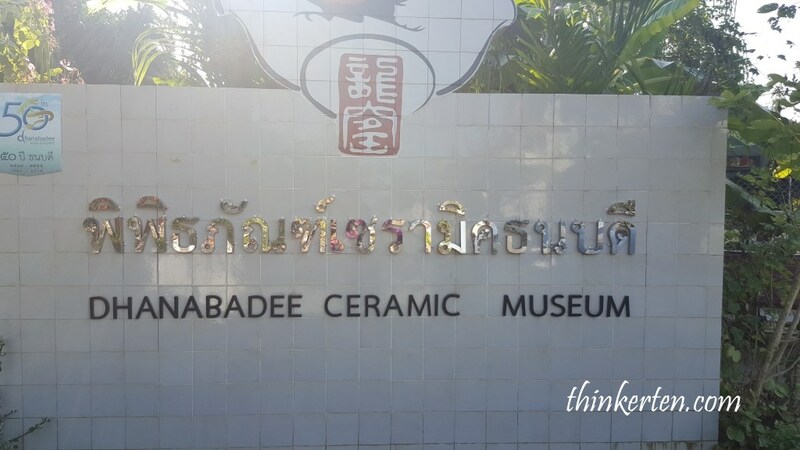 We reached Lampang at around 2pm and we visited Dhanabadee Ceramic Museum where you can see how chicken bowl was made. The location of the Museum is easy to find only if you have a GPS and have a car, it is not easy to walk from the main street. The museum is actually located in the middle of the residential area. Lampang is famous for it chicken bowl and I thought it was a good idea to escape the heat from 2pm to 4pm, so I gave it a go to visit the aircon museum. There was this guide who speaks decent English to guide us through the factory. There is an entrance fees charges, 100 Baht for foreigner and 50 Baht for local Thais. 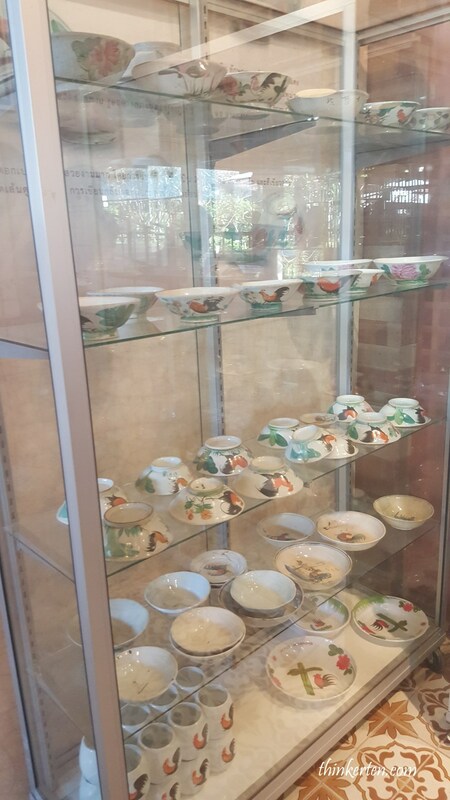 The history of the chicken ceramic bowls goes back to China. These were the chicken bowl display at the museum. No assembly lines here. Each step employs real people for hand crafted careful skilled and artistic work. 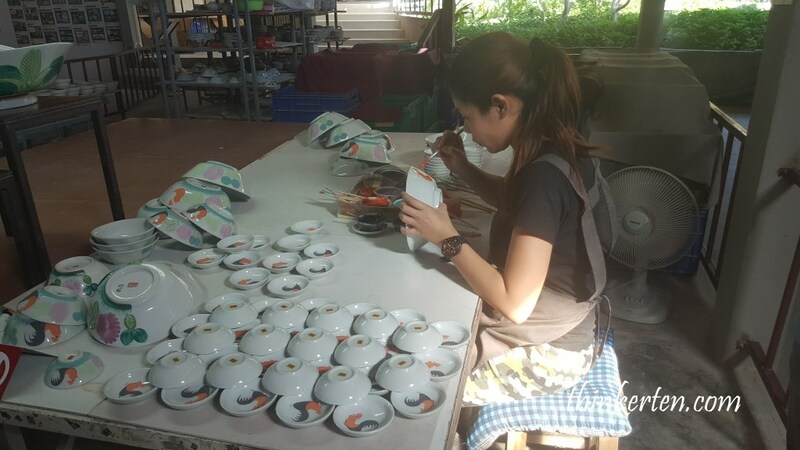 The guide told us that this young lady who is deaf was among the 200 students being chosen from the ceramic chicken bowl school to draw the Rooster in the bowl. Rooster represent men who go out to work to support the family, the big flower represent the women in the house and the banana leaves at the bottom of the bowls represent many children. They call it “museum” but I would prefer to describe it as more of a working and living ceramic factory. 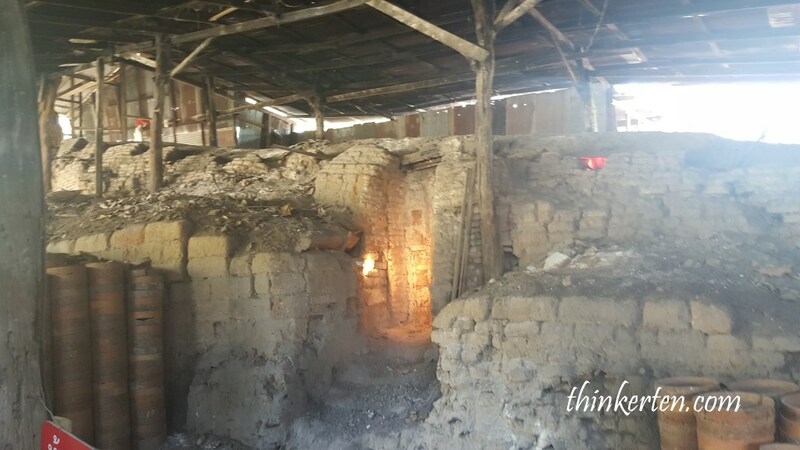 The dragon kiln here is the oldest kiln in Lampang Province and is no longer in use. This is an antique! Before we exit, we were told we can paint our own ceramic to bring home. 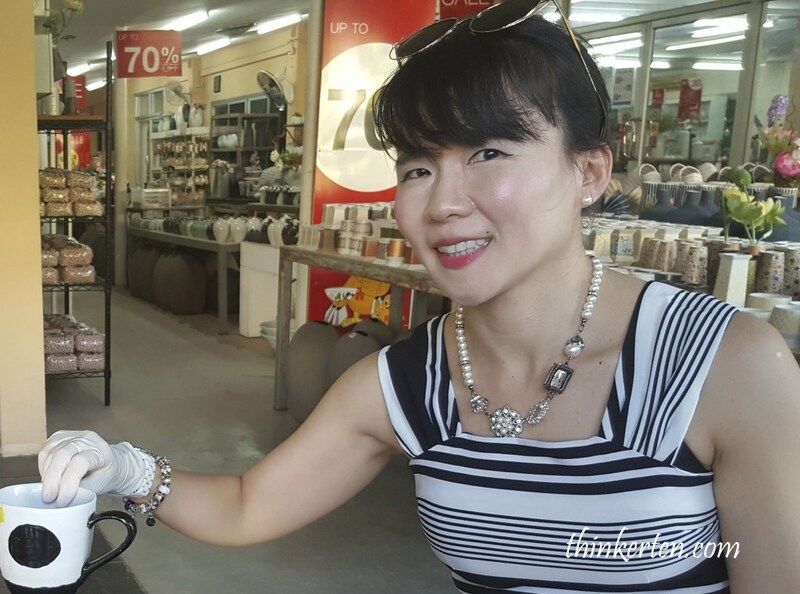 I thought this is a supercool souvenir so we sat down 1 hour to paint the ceramic. Nothing fancy, some black dot on the cup but it matches with my dress. 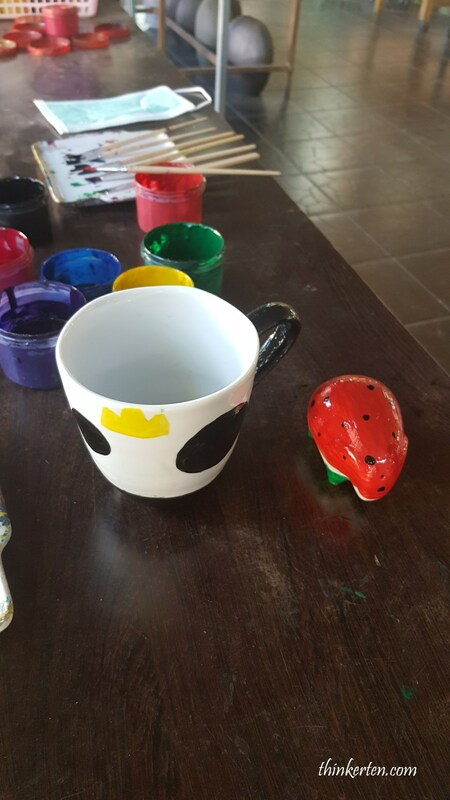 The “watermelon” Elephant was another creation of ours and it looks super cute. Too bad my black dot cup was broken when it reached home. Luckily the “watermelon” Elephant is still in one piece and “healthy”! 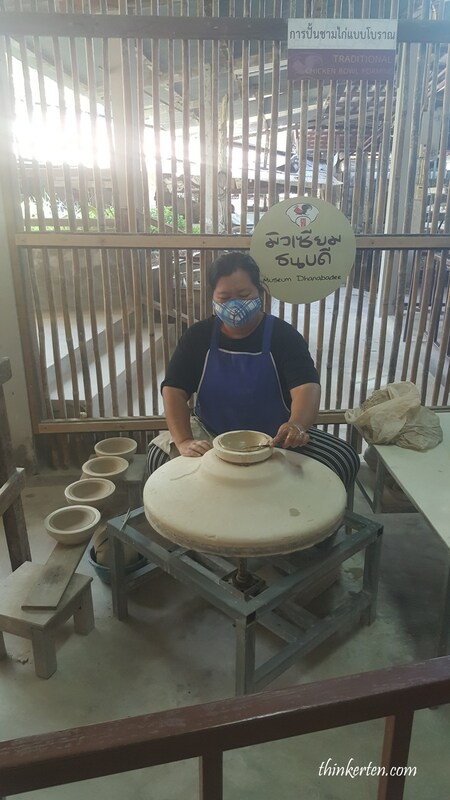 We left the ceramic workshop at about 4pm and drove to our next destination, Wat Phra That Lampang Luang. It took us about 30 mins/20km from Lampang city to reach this exquisite temples. Literally, Wat Phra That Lampang Luang means Temple of Lampang’s Great Buddha Relic. According to legend, the Buddha once visited the site some 2,500 years ago and donated a hair, which is now kept in the temple’s large chedi together with the right forehead and neck bones. The temple is one of the best examples of Lanna style architecture in Thailand. Its viharns that are open on all sides are typical of the early Lanna style. Whereas some temples have been restored using modern materials and modern building techniques, the Wat Phra That Lampang Luang has been preserved in its original state. You can still see there are sands on the courtyard instead of cemented floor which make it so different from other temples in Thailand. 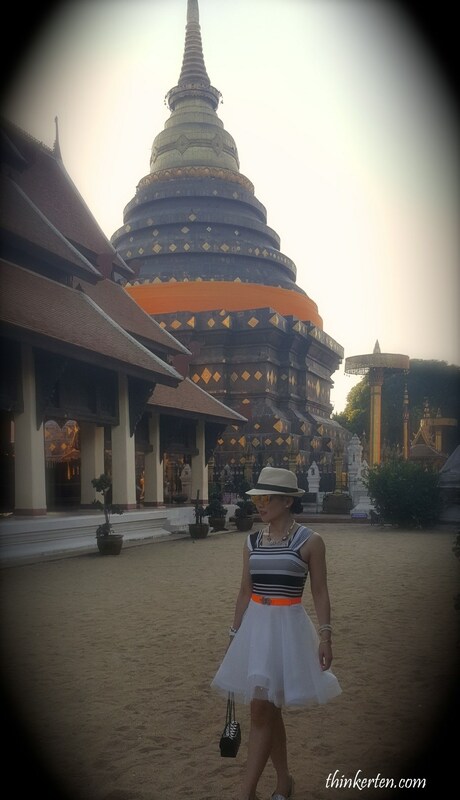 This is one of the nicest temples in Thailand. Very relaxing and gives you a great feel for the Buddhist region. It’s easy to get to and the entrance is free. There is also a huge parking lot means it is a very important temple! 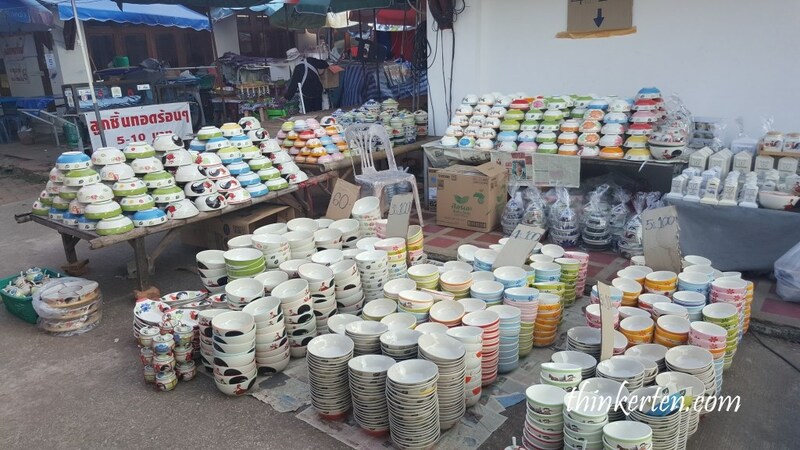 There is normally a small market alongside the temple, selling very cheap ceramic bowls. I did not get any as I have made my own from the Ceramic museum workshop. Mine is priceless! I recommend visiting this site on a cooler day if possible and by the time we ride on the horse carriage, it was about 5pm and it was just so comforting to sit and relax and enjoy the scenery of Lampang village. 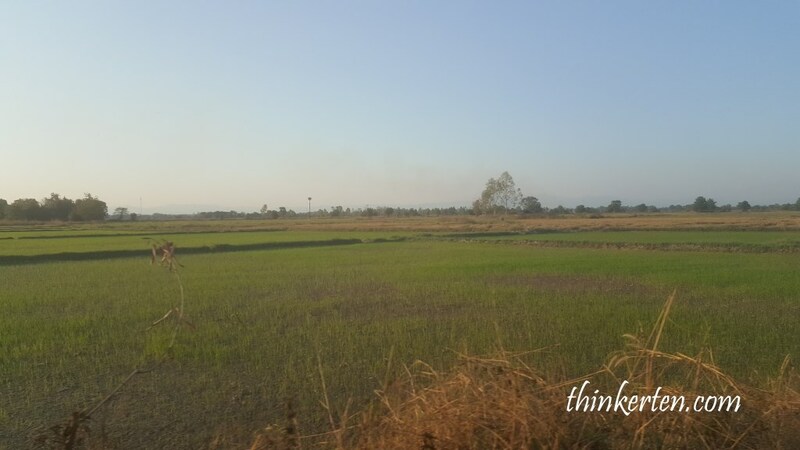 Scenic of rice fields is another unique feature that Northern Thailand has to offer. We could enjoy this beautiful scenic view on the horse carriage. The ride took us about 20 mins and we were back to the temple again. 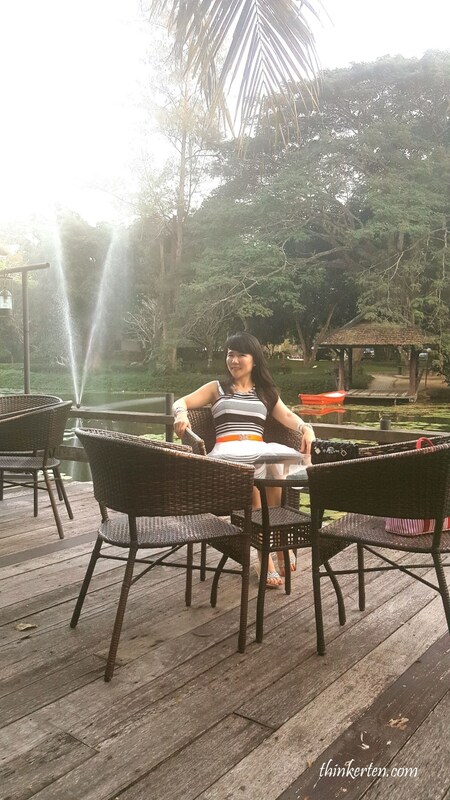 We have book Lampang River Lodge Hotel and it took us about half an hour to reach the hotel. 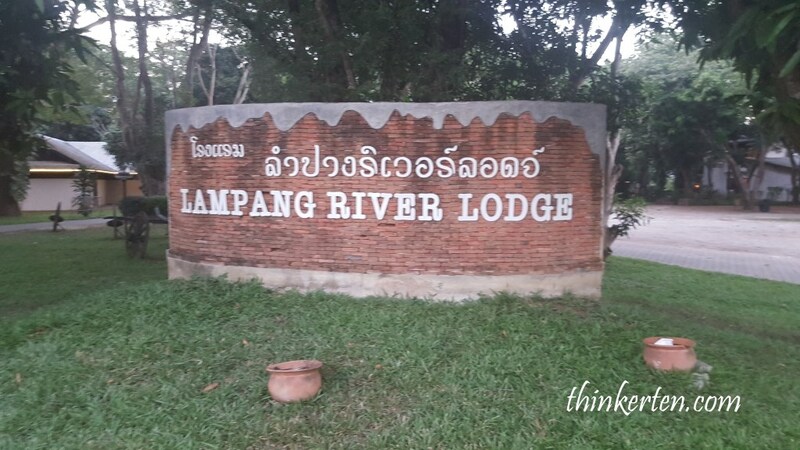 The Lampang River Lodge Hotel was located in the middle of nowhere, but thanks to the Google map, we reached our hotel on our targeted time. 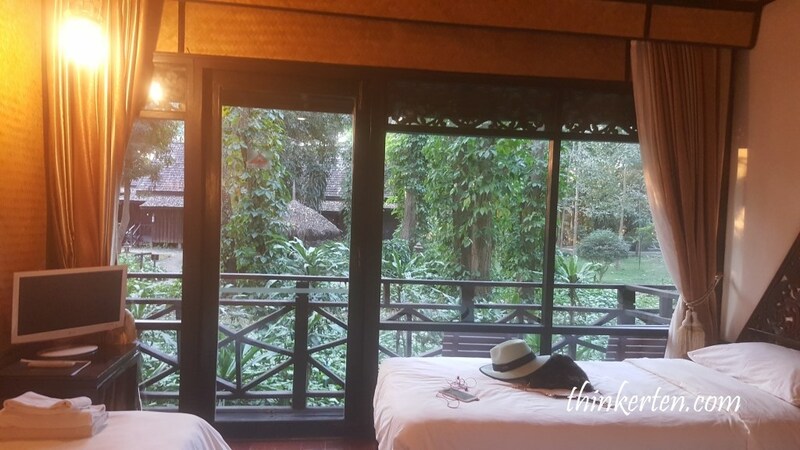 Located on the banks of the Wang River, Lampang River Lodge offers rooms surrounded by nature. 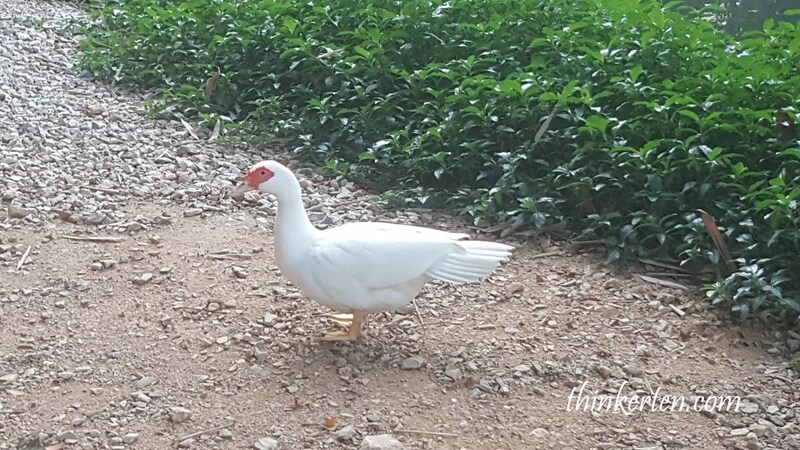 We spotted a duck beside the pond and some peacocks walking pass us. LAMPANG RIVER LODGE HOTEL creatively develops the Lanna styled resort that exudes a sense of tranquility and tradition. I was relaxing at this wonderful place after a long day. Our hotel room with the garden jungle view. No big TV but the wifi worked well. 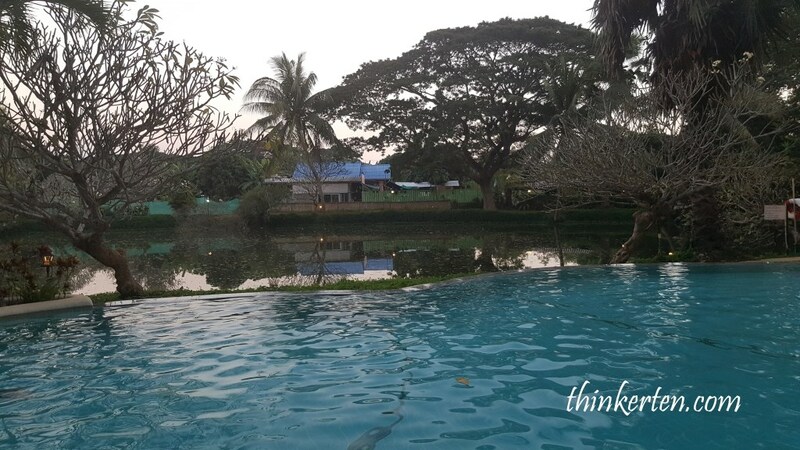 The swimming pool is just next to the river bank. We had our dinner in the hotel again as we like to enjoy the hotel to the fullest. Once again, I was glad that I brought along my weapon, the insect repellent to protect me the whole night while I enjoyed my dinner at the hotel restaurant. It an open air restaurant and the light is gloomy. 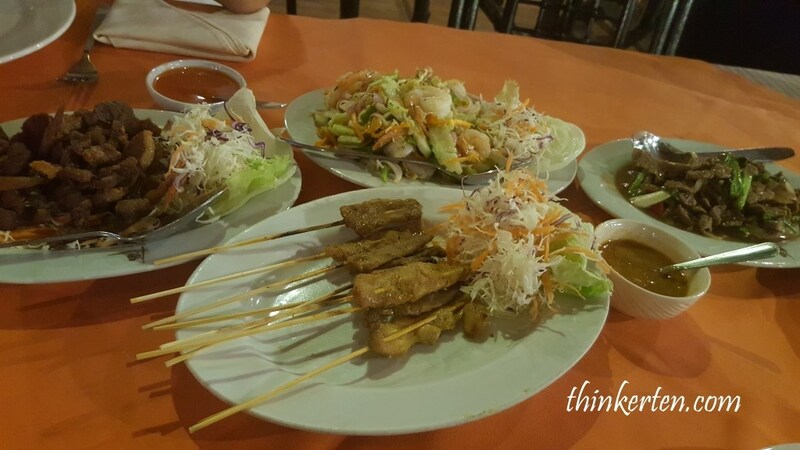 We had some satay with peanut sauce, Thai style stir fry beef, Deep fried pork- was kind of hard to chew and Thai style chili prawn salad. A lot of meat for us for the night.